The diamond jewellery market in India is booming, with many players positioned at different points on the spectrum of quality, innovation, price and design. Some of the most popular jewellery brands are D'damas, Gili, Asmi, Sangini and Nakshatra. This article analyzes the branded jewellery market in India and develops a market entry strategy for a potential player (popular jeweller) to enter the platinum jewellery sector. The key recommendations for the player include the type of jewellery collections to be launched and marketing strategies to increase platinum consumption amongst Indian women. The increasing demand for platinum jewellery in India has prompted us to study whether a Popular Jewellery Brand (PJB) which has a significant market presence in gold, diamond and contemporary categories of jewellery should consider the possibility of entering the platinum jewellery market in India through an exclusive brand. The entire study is to explore the attractiveness of the branded platinum jewellery market in India and to identify any existing gaps between consumer needs and product availability in the branded platinum jewellery market. This will help the PJB to develop platinum jewellery collections that are more in line with the consumer needs. The study also explores if there are any social barriers behind the low preference for platinum jewellery by Indian women. Identification of any such barriers can help the company to develop better marketing or communication strategies to increase platinum consumption amongst Indian women. Secondary research was used to explore the attractiveness of the branded platinum jewellery market in India. Qualitative Research was carried out to better understand the motivations of buying platinum jewellery, the buying pattern and the profile of customers who bought platinum jewellery. Qualitative Research included depth interviews using laddering and projective techniques. Further, Quantitative Techniques like Factor Analysis, Multiple Regression, Clustering and Discriminant Analysis were used to analyze responses from more than 300 current and potential consumers. Factor analysis was used to find the principle reasons for a consumer�s interest or disinterest in buying platinum jewellery. Regression Analysis was used to measure how the consumer�s opinion on the various qualities of the brand like trust, craftsmanship, range of designs on offer, value for money, etc. influenced the degree of interest in buying platinum jewellery from the group. Clustering followed by Discriminant Analysis was used to classify the consumers into groups with similar profiles, interests and needs. The secondary analysis conducted by us revealed that the branded platinum jewellery market is indeed attractive1. The volatility of gold and narrowing of platinum price fluctuations is now making inroads in the market with the focus turning to platinum. Indian jewellers predict that the demand for platinum is expected to increase by 30-40% in the coming year. According to a report by IBEF, India's share in the global platinum jewellery market is growing by 19 percent annually2. However, it is still less than one percent in the global platinum jewellery market. Given the global growth and the maturing of the Indian market to international trends, this represents an area of potential growth in India. South India is the biggest consumer market of gold and diamond in India and is the prime target for the platinum market3. Chennai followed by Bangalore are the two most important centres in terms of the platinum market. According to Platinum Guild International (India), there are around 300 stores that sell platinum jewellery. The platinum sales are expected to expand to more than 1,000 showrooms in the next 2-3 years4. 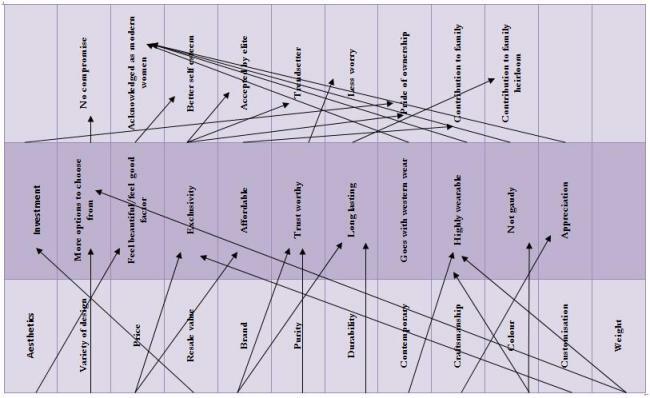 Qualitative Research including depth interview (using laddering technique) was used to understand the motivations for buying platinum jewellery and the associations of attributes with personal values. Since traditionally Indians have a cultural barrier towards accepting precious metals other than gold, projective technique was also used. Projective techniques were used to gain an understanding of cultural conditioning that would prevent Indians from buying platinum jewellery. The results of our consumer survey and interviews are described in this section. What makes platinum jewellery appealing to consumers is its elegance and sophistication. The platinum jewellery designs are considered to be contemporary and hence appeal to the young and trendy. Respondents believe that these contemporary designs go well with western formals and party wear. Some users also feel that platinum is the jewellery for the modern, independent woman. Consumers feel that gold jewellery needs more effort in terms of maintenance compared to platinum jewellery. Since platinum is stronger than gold, it is sturdy and scratch-resistant. Platinum jewellery can be worn every day. Some consumers preferred platinum because of its exclusivity. It is costlier than gold, so only the rich can afford it. It helps the wearer make a status statement. Most Indians consider jewellery as an attractive investment. However, unlike gold, platinum has no resale value. This reduces its attractiveness as an investment or heirloom. Moreover, when platinum jewellery needs to be mended there are not many craftsmen available. Platinum jewellery is preferred for everyday wear as it looks contemporary and goes well with western wear. On weddings and on auspicious occasions like Akshaya Tritiya, gold is still the preferred choice. Platinum jewellery is preferred for engagement rings and for occasions like Valentine�s Day, wedding anniversaries, etc. Young couple like to buy a pair of platinum rings for anniversaries or engagements. Platinum jewellery is mostly bought for gifting. Due to its high cost, people buy platinum only as gifts for someone very dear to them. Consumers would buy more platinum jewellery if it were introduced by a well-known brand. They would consider platinum if it came with a certificate of purity from the Platinum Guild. Jewellery shops could introduce mending of broken platinum jewellery by their in-house craftsmen to increase purchase. A few people are unaware that platinum is rarer than gold. They would consider buying it if the worth of platinum were advertised to them. Loyalty cards and discounts will also incentivize them. Consumers would like to personalize the design of platinum jewellery through virtual portals. These virtual portals enable them to choose the design, type of metal and precious stones. They are ready to pay a premium for this facility. Quantitative analysis confirmed our hypothesis on the potential customer and helped us to identify the jewellery collections to be introduced. Quantitative Techniques like Factor Analysis, Multiple Regression, Clustering and Discriminant Analysis were used to analyze responses from more than 100 current and potential consumers. Factor analysis, clustering and discriminant analysis were used to segment the potential customers of branded platinum jewellery. Using factor analysis we divided platinum users into 3 consumer segments: Stylish and outgoing personality, status-seeker, modern professional women and non-platinum users to 3 segments quality conscious, responsible family person and social and price conscious . These categories are very important and the PJB should launch separate platinum jewellery collections to cater the needs of these various segments. Using multiple regressions, the equation generated showed that the customers preferred/favoured a particular brand of jewellery based on the variables in the order of priority as trust, craftsmanship, value, design and recommendations by friends and family members (reference groups). Hierarchical and non-Hierarchical Cluster analysis is used to differentiate non-platinum users from potential/current platinum users. Various attributes that are important for each of these clusters are identified in Exhibit 2. Using discriminant analysis we identified the major attributes that a customer looks for in branded jewellery over unbranded jewellery. These are customisation, mending & exchange, quality of jewellery, discounts, reputation and personalised service. Shifting regular users/ frequent buyers of other jewellery to platinum jewellery. 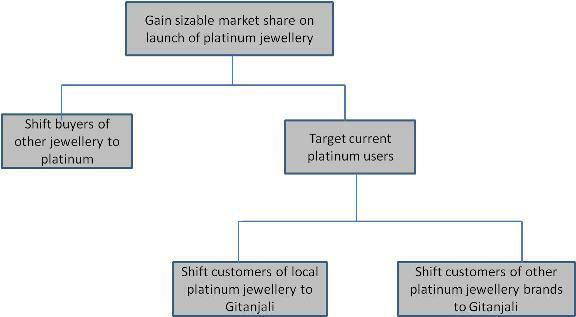 Shifting regular users/ frequent buyers of local platinum jewellery to platinum jewellery by PJB. Based on our research, our recommendation to PJB is to enter the platinum jewellery market in India. PJB should launch 3 jewellery collections � Uber Cool, Romantique and Sophistique - under an exclusive brand. Uber Cool targets the modern woman. This collection should focus on contemporary designs, be suitable for everyday use and have a lower price range. Romantique should target people in a relationship who identify platinum as a symbol of love and romance. This collection should include engagement rings, love bands and Valentine�s Day gifts. Sophistique is for the status seekers. This collection focuses on heavy jewellery suitable for party wear, exclusive designs and high price range. Our research indicates that the reason for consumer interest in buying platinum from PJB is the trust on the brand and the value it offers for money. So PJB�s marketing communications should highlight these qualities. PJB should also develop a strong communication strategy to convert non-platinum users by advertising the unique features of platinum jewellery. The features of platinum jewellery that should be highlighted are that it is sturdier than gold so involves less maintenance. The advertisements should also focus on the fact that platinum is rarer than gold. Platinum is considered as a poor choice of investment, so projecting it as a good investment choice will also increase its attractiveness amongst non-users. Potential consumers all want a purity certificate and wide range of designs. So introduce guarantee cards for purity and to increase resale value. This will convert non-platinum users who see jewellery as an investment. Our research indicates the potential for high growth in the branded platinum jewellery market in India. We recommend that PJB leverage its brand equity in branded jewellery to enter the platinum jewellery market in India. Exclusive jewellery brands command better premium. So it should introduce its platinum jewellery collection under an exclusive brand. The 3 jewellery collections that it should launch are Uber Cool, Romantique and Sophistique. The company should invest in marketing and communications strategy to overcome social barriers and convert non-platinum users. The future scope of the market research conducted by us includes conjoint analysis to decide the individual jewellery items that PJB should launch. Multi-dimensional scaling can also be done to help PJB position itself with respect to its other competitors.